British (English) reforming Liberal politician. His career was ruined by the 'Crawford Scandal'. ALS. 1p. 76 Sloane Street, S.W. July 24th 1870. 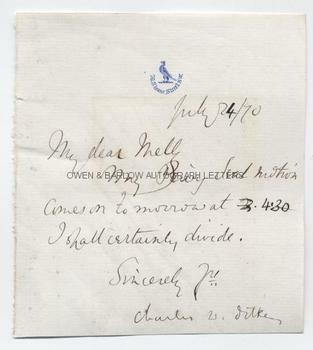 To [George] Melly [M.P.]. "My Privy Seal motion comes on tomorrow at 4.30. I shall certainly divide". 12mo. Approx 5 x 4.5 inches. Trimmed at foot and lacking integral blank leaf. Mounting residue to verso. All else very good. Charles Dilke introduced his motion to abolish the sinecure office of Lord Privy Seal (one of the oldest political offices in British politics) in 1870, on the grounds that it was a role that served no useful purpose and that it was an unnecessary expense. He quoted the words of Pitt who said that when the Prime Minister was a Peer, the duty of the Lord Privy Seal was "to sit near him in the House of Lords and keep off the moths". The motion which Dilke refers to in his letter was for an amendment to a resolution previously proposed for reform of Government offices, adding a proposal for the abolition of the office of Lord Privy Seal. It divided the House Ayes:170, Noes: 60 (W.E. Gladstone speaking against it) and was carried by a majority. Of course, despite the vote, no enactment was made abolishing the office, which persists to this day.